This soup is scrumptious and I cannot wait for you to try it. I came to create this soup because I wanted to make the soup, Zuppo Toscano, that is from Olive Garden. My co-worker and I went to enjoy the unending soup and salad promotion they generally offer in January and February – once I tasted that soup, I wanted to know how to make it. I have been working on it and tweaking the recipe ever since. It only vaguely resembles the Olive Garden soup now so we call it Knock Your Socks Off! 1 14.5 oz.Can Diced Tomatoes. 1 Cup Kale cleaned and chopped with that woody stem cut off. Break out the Crock Pot! Put in the sausage, potatoes, chicken broth, can of diced tomatoes, and JUST enough water to cover but ONLY if you need it. Whisk the flour into the heavy cream, make sure to get lumps out and all other items are chopped very finely – makes a huge difference! 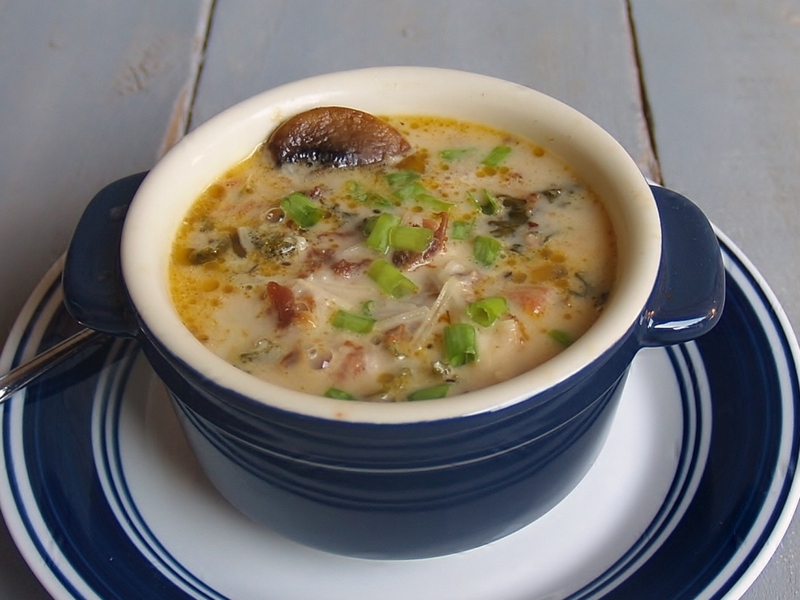 Put the cream, kale, mushrooms, and bacon into soup. Cook for another 30 – 45 minutes. Sprinkle with freshly grated Parmesan, bacon bits, and green onion if desired then serve! This may be put into containers and frozen for lunches. It is delicious! 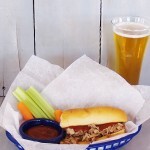 This recipe is posted at Weekend Potluck — come on over and check out all the recipes — just Click Here! Sprinkle with freshly grated Parmesan, bacon bits, and green onion if desired then serve! This may be put into containers and frozen for lunches. It is delicious! how many servings does this recipe make? I have a family of five that always comes back for more! Well Candice – it makes 14 one cup servings and it served our family of 4 (one of them eats like 2 people) very well for two meals. Here are my suggestions for this soup: add 1 large chopped onion, & 2 chopped garlic fried with the sausage; cut the cream way down to about 3/4 cup; add a couple parmesan cheese rinds & use real bacon that you fry yourself. Your receipe got me started on a great soup that I’ve been wanting to make for a long time though. Thanks. Wow! That sounds delicious! Thanks for dropping by! I don’t have a favorite because I love soup ! I really like creamy soups the most. Yours sounds wonderful ! I would love one of those crockpots!! I agree! Me too! Good luck! I love all soups but I think butternut squash is my favorite. That’s always a good choice! Aren’t they the greatest! And cheaper than the bigger brands as well – I love them! That’s the way to be – I don’t understand when people don’t like soup – what’s not to like? Good Luck! my favorite soup this month is creamy corn and crab chowder – so good! Sounds wonderful – I may cook it in an old-fashioned pot on the stove. That’s a great idea too – and some times, I will probably do that too! Does Chili count as a soup – Cause I LOVE all kinds of Chili. Of course it does – at least it does with me! Thanks for dropping by and please come back again! I can’t wait for cooler weather so I can make a large pot of Minestrone! That sounds wonderful! It was cooler here for a while now it’s hot again. Thanks for dropping by and please come back. Good Luck! My favorite it tomato with big fat kluski noodles. That sounds wonderful! I don’t believe I have ever had it that way so I must find a recipe. Good Luck! Oh yum! I haven’t thought about that since last year……..I need to make some! Thanks for dropping by and please come back again! Boundary water chicken and wild rice-it is killer! This sounds very interesting! how do you make it? 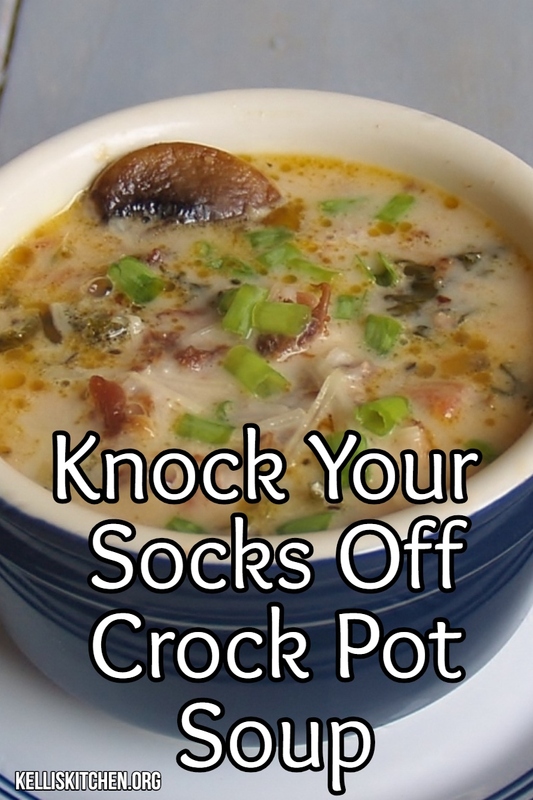 YUM, I love soup from the crockpot, so easy….thanks bunches!!! You are welcome! Thanks for dropping by and plese come again! There was a Red Gold plant here in town where my husband grew up….he grew up eating Red Gold tomatoes and drinking tomato juice….needless to say I use nothing but Red Gold…especially in my chili…which is my all time favorite soup! That’s wonderful Kim! Thanks for dropping by and please come again! YUM! Thanks for dropping by, please come again! Good luck. My favorite soup is Vegetable Beef with pastas. Those are always great, aren’t they? Thanks for dropping by and please come again – good luck! I just made Beef Stew today. It might be one of my favorites! Beef Stew sounds wonderful! Thank you for dropping by and please come back again! Soup looks great and just in time for fall. Thanks for dropping by and please come again – good luck! The best kind of soup – isn’t it? Thanks for dropping by and please come again! Good Luck! I have over 100 soup recipes – I just don’t think I could possibly choose a favorite. But my go-ts for family when I need a delicious soup that I know the whole family will enjoy are usually Loaded Baked Potato Soup or Italian Wedding Soup. Both are really easy to adapt for vegetarians (which I often feed) and always turn out great! I love both of those soups! It just sounds wonderful right now, I must be really hungry…..Thanks for dropping by and good luck! Chili is always good – thanks for dropping by and please come back again! My favorite kind of soup is split pea with ham, homemade of course! In the winter months I make a couple of times a month, I always have a ham bone and leftover baked ham in the freezer. I haven’t had that in years! People in this house have an aversion to peas of any kind, but that sounds so lovely! Thanks for dropping by and please come by again – Good Luck! I love mushroom soup and this looks like something with a little more body, and maybe even better than plain mushroom. Most soup from a crock pot is very good. Thanks for a great recipe! Thank you for dropping by and please come again! Good luck! YUM! That sounds delicious! Thanks for dropping by and please come back again – good luck! Love homemade turkey noodle soup. I have never had that but it sounds wonderful! Thanks for dropping by and please come again. I love the Zuppa Toscanna! Oh gosh – me too! 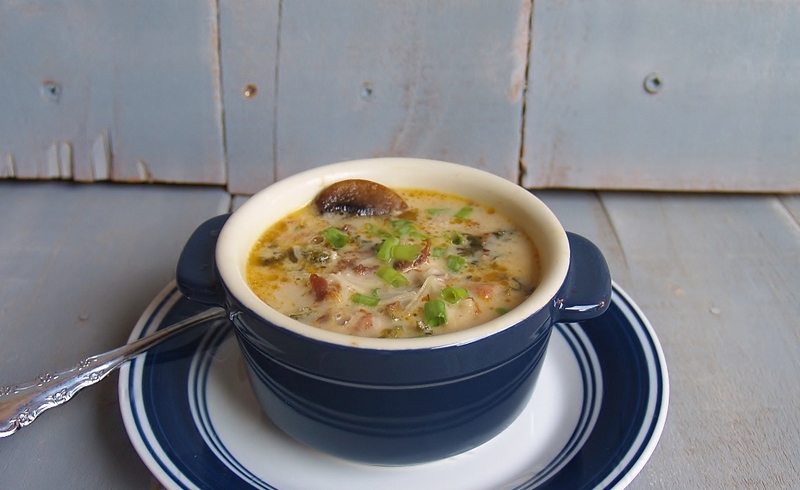 This is how it started out – my love of Zuppa Toscanna. Thanks for dropping by and please come again! Chicken pastry?? This sounds like something I need to hear more about! Care to share? Thanks for entering! Can’t wait to try this recipe! So glad I stumbled upon this site! Thank you Laurie! Thanks for dropping by and goodluck! I love chili and creamier soups. One I make repeatedly is a crock pot meatball tortellini soup. It’s excellent! Boy that sounds like a dynamite recipe – I would love to try it! maybe I can figure it out. Thanks for dropping by and please come back. Good luck! I like almost all homemade soups. Me too! Thanks for dropping by and please come back. Good luck! Oh my mother’s chicken-n-dumplings are a MUST several times a year here. I just know you’ll love the recipe! Thanks for dropping by and please come again. Good luck!! Me too Karen – but I wasn’t always like that. When I was younger, I disliked soup but that was because I only had canned. Thanks for dropping by and please come back! I love all soups but my favorite comfort soup is tomato! Oh, creamy tomato! So lovely with a green salad. Thanks for coming over – please come again! Good luck! Oh yes! So yummy, isn’t it? Thanks for dropping by and please come again. Good luck! This soup looks awesome! Cannot wait to try it!!!! Thank you Linda! I love it – please come back again. Good luck! My favorite soup is loaded potato! That is a great one, isn’t it?? Thank you Julie! I think you will love it! Please come back any time. Good luck! Such a great soup! Thanks for coming over and please come back – Good Luck! You have to love soups like this on cool Fall days and as Winter rolls in!!! Oh I do too! Soup is a great warmer-upper! Thanks for coming by and please come again! Good Luck! My favorite is cheesburger soup. But this soup sounds awesome. I cannot wait to try it. Thank you so much – I really think you will like it! Thank you so much for coming by – good luck! Sounds delicious! So glad you dropped by and please come back again. Good luck! I Love soups! It is hard to pick just one! I guess my favorite would be potato. I am just about ready to put some chicken broth on now to make potato soup for dinner tonight. I love it too! Thanks so much for coming over and please come back again. Good luck! Me too! Don’t forget to go over there and enter! Good luck here as well and thanks for dropping by! I love so many different soups…French Onion Tomato Soup is a tasty one. Well – I’ve never heard of that! YUM! Thanks for dropping by and please come again. Good luck! I can’t wait to try this soup. Thank you! Thanks also from dropping by and please come back again. Good luck! I love any of the cream soups this time of year, but I guess my favorite is homemade cream of onion with smoked sausage, fresh corn and potatoes. Well that just sounds out of this world good Kris! Thanks for coming over to check it out and please come back again. Good luck! Thank you so much Karen! I’m so glad you found me and hope you come back many times! Good luck. Mmmm! That sounds so good. I love Italian sausage, and I love potatoes and celery in soup. Can’t wait to try it. Let us know how you liked it. Thanks for coming over and checking me out – please come again! Good Luck! Hi Roz – I can help you with that – all you have to do is prepare everything in the stock pot, bring to a boil then simmer for about 20 minutes. Add the cream, mushrooms and kale and simmer another 5 minutes – you are done! Easy Peasy. Thanks for coming by and please come again. Good luck! I like most all soups but my current favorite is chicken tortilla. My favorites change too! I remember when I couldn’t get enough potato soup. 🙂 Thanks for coming by and please come back again. Good luck! When I was little I was disappointed when the meal was soup but gosh, now I love it! It’s somehow so comforting and feels good to not only the body but mind and soul! 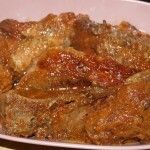 You’ve done a wonderful job on this recipe! Thank you so much! I totally understand! But when I was a kid our soup nights involved the canned kind and I hated it. Thank you so much for your compliments – please do come back! Good luck! Looks great! Unless I miss it in all the comments, the recipe calls for 1can of tomatoes and 1container of mushrooms. What size can and how many ounces of mushrooms? I am sure my family will love this. Not at all! I’m so sorry – it was a 14.5 ounce can of tomatoes and a 16 ounce container of fresh mushrooms. Thanks for asking! I also want to thank you for coming by . Please come back and let me know how you like it! I’m going to edit the recipe now. good luck! Oh yum Linda – that IS a great one. Thanks for dropping by and please come back. Good luck! I love a loaded baked potato soup! YUM! Me too! Thanks for dropping by and please come back! Good luck. Sounds really good with winter around the corner it will be hot and nourishing. I like creamy potato soup with chopped ham. Sounds so wonderful! Thanks for dropping by and please come back! good luck! I love potato soup…But, I love soups and the best thing about cooler temps is getting to try new recipes and old favorites. I will be trying this one soon…I think it might just knock my hubby’s socks off! I think it will to Terry! Thanks for coming by and please come by again – good luck! That’s a great soup Carissa! Thank you so much for dropping by and please come by again. Good Luck! This soup looks delish! Can’t wait to try it!! Great – thanks for the compliment and please come back again! Good Luck! I love the soup at Olive Garden, your recipe sounds like a winner! Thank you! I love it too but this one is great too – so I will eat both! Thanks for dropping by and please come by again. Good Luck! This soup sounds so delicious!! In Tampa, Florida, we would pair it with crusty, Cuban bread. Oh how I love Cuban bread! Thanks for coming by and please come again. Thank you! Soup looks delish! I’m going to save the recipe till it gets autumn-like here. May be a while. I can’t find Red Gold products here; I live in the San Diego area. Perhaps you can direct me to a local retailer ‘cuz they look delicious. Think I’ll make some of my Tuscan bread to go with that wonderful soup and call it a meal. Thank you Dave! Red Gold is also sold under the names RedPack and Tuttorosso. They also make Sacramento tomato juice. I read on their website that they make many Private Brand or Store Brand tomato products at their subsidary sites. I have been using Red Gold for years and years talking about them on the blog LONG before they ever sent me products and I do love them. I hope you can find their sister brands where you are! 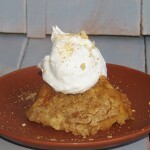 I made this tonight after seeing the recipe and all I can say is OMG it was out of this world – the only thing I would do different is double the recipe because it is not going to last long in this house. Thanks for posting such a wonderful soup recipe. Well Judy! Thank you so much for your testamonial -you know, I always worry when I create a recipe because my family will eat lots of things and others may not. Bless you for letting us all know you liked it! Thanks for dropping by and please come again! That’s a good and easy way to be! Thanks for dropping by and please come again. Good luck! Love soup and this one looks yummy! Thank you! I appreciate you coming by – please come again! Good Luck! I use Red Gold tomato products exclusively. Love this soup. Me TOO!! I fell in love with them long ago and they are superior to anything I have access to. Thanks for coming by and please come again! Oooh — this soup sounds souper! ;o) Definitely on our “give it a try” list. Our favorite soup has to be Potato shrimp soup. It’s like loaded baked potato soup with shrimp thrown in at the end. Yummmo!!!! Potato shrimp? Well that just sounds awesome! I am learning about so many wonderful soups from comments on this post – I must try your version with shrimp thrown in at the end. Thanks for dropping by and please come again! Good luck! My favorite soup is beef barley vegetable——yum! Oh – so warm and comforting! Thanks for coming over and please come back again! Good luck! You know – I haven’t even thought of my favorite two Asian soups! Thanks for reminding me, yes egg drop soup is fantastic. Thanks for dropping by and please come back. Good luck. Potato, bacon & leek soup. Oh yes, that’s a wonderful one isn’t it? My mouth is watering just thinking about it. Thanks for dropping by and please come again! Good luck! We love soup in our house, can’t wait to try this! I think you will love it! Thanks for coming by and please come back. Good luck! This soup looks amazing! Sadly, I don’t know how to shop for Italian sausage. Is this a bulk sausage or in links? I bought mine over by where they sell the 1 lb. rolls of sausage – often times a brand will also have Italian Sausage right beside it and I just grabbed one of those. Or, get some Hillshire Farms or Ekrich links of Italian Sausage which is right by their brand of brats and hot links or Polish sausages, slice those babies open and go to town! Thanks for dropping by and please come again! Good luck! My favorite soup is loaded baked potato soup. That is a popular one and one that I like very much! Thanks for dropping by and please come back again! Good luck! My all time favorite soup is the Olive Garden Suppa Toscana , LOL I think that’s how it’s spelled. No matter it is the BEST.Hope your recipe is as good. I don’t remember that soup having tomatoes in it. However I’m going to try yours today. Thank you so much . Hi Sylvia! It’s not Zuppa Toscana it started out at my search for that and then I started adding things – that’s why I mention it. Thanks for dropping by and please come back! Good luck! Can’t forget the cheese and croutons! it’s a favorite of mine too! Thanks for dropping by and please come again! New England clam chowder is definitely my favorite, not too chunky though please! It’s supposed to be soup not a stew but some people seem to thinks they need to add tons of chunky stuff to make it better. An excellent choice! Thanks for dropping by and please come back again! Good luck! I Believe you will like it Phyllis – Please let us know as some already have – Thanks for dropping by and please come back again! My favorite soup is tomatoe basil. That’s a great one Angie! Thanks for dropping by and please come back again. Thank you! This soup looks yummy, I can’t wait to try it. That’s a great soup too! Thanks for stopping by and please come back again. Good Luck! me too and it’s cool enough to have some lovely minestrone soup right now! Good Luck! My favorite soup is any soup other than Split Pea, yuck! Lol In all seriousness, my all time favorite soup is one my Granny always made using the left over hambone from Sunday’s supper. It’s a lot like veggie soup but with that smoky deliciousness of hunks of ham! She always added cabbage, potatoes, carrots, green beans, okra and yummy tomatoes from a can. To make it stretch, she’d add pasta the next day which only made it better! I love to make it for my family now, and they just eat it up! Sorry, I got a little wordy, but I LOVE Granny’s Ham Soup! Oh, don’t worry about being wordy! I’m always wordy! Your soup sounds wonderful – especially since it was your granny’s recipe! Good luck! It’s really hard to decide my favorite soup…but I’ll go with Chicken Dumpling soup. It’s so comforting and delicious! Sounds good right now at lunchtime! Good luck! 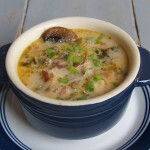 I love to make and eat seafood chowder, so yummy! Yes, that IS very good! Good luck! Love Taco Soup! Good luck! Great soup recipe! How about those Red gold maters. Any recipes with them that are yours??? Could you please tell me if you drain the tomatoes or not? Yes, I did drain the tomatoes but because I was making this recipe up as I went – I ended up adding them back in. If I were you, I would drain them and then add them back if you need to. Thanks for dropping by! Please come again. 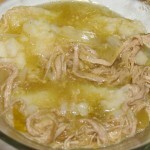 Hi Kelli would love to make the this soup for a start to CHRISTMAS Eve dinner. My husband is Gluten free tho, what can I thicken with instead of regular flour ? Hi Karen! How about some cornstarch? Just mix it with a little warm water to make a slurry and add it to the soup instead of the flour – it will be great! Karen, My friend – Foodie Stuntman said he would not add flour at all – he would do this (he knows more about gluten free than me!) I would have browned a mirepoix in a stockpot before adding your tomatoes, potatoes, sausage and chicken broth. Simmer until veggies have softened and sausage is cooked through, then blend the soup in batches before adding kale, mushrooms, bacon and cream to thicken. I tried this soup yesterday all I have to say it is absolutely fabulous. My husband and I both loved it. I can see why you love this soup it looks excellent! Yes of course! Sometimes I put in spinach, broccoli or sometimes I just leave it out — good luck and enjoy! Thank you so much for sharing your awesome crock pot soup with all of us at Weekend Potluck – this looks and sounds amazing!! We hope you stop by again this Friday to share more of your delicious recipes! You are welcome! Thanks for dropping by and please come again! Fantastic Soup!!! I added 1 small onion which was finely diced and sauteed with the mushrooms; 1 Tablespoon minced garlic and 1 Tablespoon Mrs. Dash Original Seasoning. The green onions were shown in the picture of the soup, but not in the ingredient list. So I add them with the remaining bacon pieces just before serving. Thanks for sharing this great soup recipe. I’m so glad you liked it! The changes you made sound lovely! I live in Plattsburgh which is way upstate NY and we do not get Red Gold tomatoes But I make a 15 bean and ham cajun spiced soup that is a knock out. I simmer it down with a spatter screen over pot to help it thicken and keep cat hair out .. includes Cajun spice and crushed red peppers and whatever else I decide. Sounds wonderful! You can use whatever tomatoes you want but we just use Red Gold down here a lot! 78F is cooler weather in Venezuela! but that doesn’t stop us from enjoying soup…and this sounds like a winner. thanks for sharing the recipe. Oh my goodness! That’s pretty warm but still — soup is always called for! Thanks for dropping by! I found a recipe for Zuppo Tuscano that calls for coconut milk instead of heavy cream. You need to refrigerate the can of milk and use only the fat that rises to the top. Add it to the pot and heat through just before serving. Tastes just like Olive Garden’s! why aren’t all recipes printable .. I tried to print this soup recipe & I printed 14 pages of ads .. I wish recipes were made easier to print ..
Hi Charlene — they are printable and all you have to do prior to printing is click out the parts, including ads and photos, that you do not want to print. I will go over and see if something is wrong with the plug in and if so –I will fix it right away! Thank you. Made this last night. I doubled the recipe and followed all the directions. My crockpot decided to break down mid cooking. So transferred it all to a soup pot. The soup was really really good. Mine had a pink tint to it because of the tomatoes and it was kind of off putting but it still tasted wonderful. If I make it again, I might leave out the tomatoes because of that. Made this soup tonight with a couple changes. It was delicious! No kale, my husband doesn’t like kale! My milk was sour so I left it out. Thank you for the recipe! Will definately make again & will try to make it with all the ingredients! What kind / size of potato did you use? I want to make this soup this coming weekend. I don’t eat potatoes too often so never have them on hand. I used Yukon Gold potatoes but whatever you can get at the store would probably be fine. Good luck and I hope you enjoy! !